The Battaglin S11 offers the feel and function of a performance road bike at an outstanding price point. With a stiff alloy frame, carbon fork and a Shimano 105 groupset, the S11 is an affordable introduction to the speed and freedom of road cycling. The S11 is built on a heat treated 7005 alloy frame for a combination of lightness, stiffness and efficient power transfer. The fork legs are made from a 3K carbon fibre weave in a uni-directional lay-up, offering a further weight saving and improving acceleration and climbing performance. The geometry focuses on versatility and encourages a more relaxed posture, helping you stay comfortable over long distances. The S11 comes equipped with Shimano 105 groupset components, except the chainset and brake calipers, but includes brake levers/gear shifters, front and rear derailleurs. 105 offers smooth, serviceable shifting across 20 gears, with Shimano providing great braking performance and neat, unobtrusive cable routing beneath the bar tape. The wheelset is provided by Fulcrum (Racing 7) and features alloy rims, good looks and excellent performance. The wheels also feature quick release axles for easy maintenance and storage, and Michelin Lithion 2 tyres for dependable traction and durability. Each S11 is fully built, tested and tuned by our team of qualified mechanics to ensure your bike arrives in perfect condition. Please note the the image (2012 bike) may not reflect the written spec listed below. The spec is correct. Correct image will be updated shortly. I am 6ft3in, inside leg 34 in. I'm guessing XL would be the right size? Adivce, please. Additional information about Adda1 could not be loaded. I can confirm the XL would indeed be suitable for you. Hi I am 6ft tall with an inside leg measurement of 89cm/35 inches, what would be the correct bike size for me? Additional information about Iainsone could not be loaded. With the sizes provided I would recommend the Large size for you. I can confirm that for your height and inside leg measurement you would need the large in this bike for a good fit. I hope this helps. advice on the best size? Height: 185cm Inside leg: 84cm and my "ape index" is 3. Additional information about frapgadz could not be loaded. My height is 187 cm, inside leg is 87 cm and arm span is 180 cm. Which size would you suggest? Additional information about Adamski858 could not be loaded. What are the largest width tyres you can fit to the bike? Additional information about Si99uk could not be loaded. 700x25c tyres would be the largest tyres you could fit to this bike. Could this be fitted with a 12 - 32 cassette? Weight for large please. Could this be fitted with a 12 - 32 cassette? There are two weights listed for the large frame here in the Q&A, 9kg and 9.5kg which is correct? Additional information about Lovro could not be loaded. Unfortunately the rear derailleur supplied with this bike would not be compatible with a 32 teeth sprocket. With regards to the weight, the manufacturers do not list this and as such we can only offer an estimation. 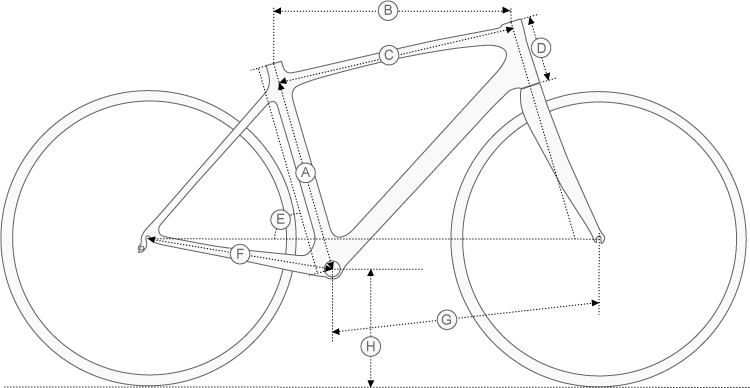 Due to manufacturing tolerances and frame sizes, the bike wight should be around the 9 Kg mark. Hi, I'm looking at getting the Battaglin S11 105 and was wondering what size to get. My height is 184cm and inside leg measurement is about 83 / 84 cm. Having just looked at some of the previous Q & A's, some of the answers seem to contradict alittle, mainly between the L and XL. Any help greatly appreciated. Additional information about Hilzy could not be loaded. With the measurements provided I would recommend the Medium size for you. I can confirm that the medium would be the correct size due to your inseam as the stand over height of the large would be to big for yourself. I hope this helps. I'm 1.87cm (6.1/6.2) and my internal leg is 86cm/34inches. I'm new to road bikes so not sure what my right size is. Large or extra large? Additional information about br84 could not be loaded.